Today is the day we all have been waiting for. Coffee Stain Studios have finally announced that Goat Simulator will be unleashed upon the Steam platform at April 1st! Marketed as "The world's dumbest game", goat simulator was an Alpha game, not meant to be released at all. But as more and more people watched footage from it, they also wanted the game more and more. It all got to the level where the game have become a real game project to be released on steam. "Goat Simulator was inspired from old-school skating games, where, instead of being a skater, you’re a goat, and instead of doing skating tricks, you wreck stuff. Charging into a table and knocking it over yields points, and if you can manage to do it while doing a backflip first and a 360 afterwards, you’ll score even more points. With Steam integration, Goat Simulator will also support Steam Workshop where players will be able to make their own goats, missions, levels and more." They also announced that people will be able to test the game at GDC San Francico at March 17-21 2014, as well as, Gone North Games "A Story About My Uncle" that is to be published by Coffee Stain Studios this summer. Personally the release date for Goat Simulator makes this feel like a very elaborate April Fool's joke, but I surely hope that it is not. 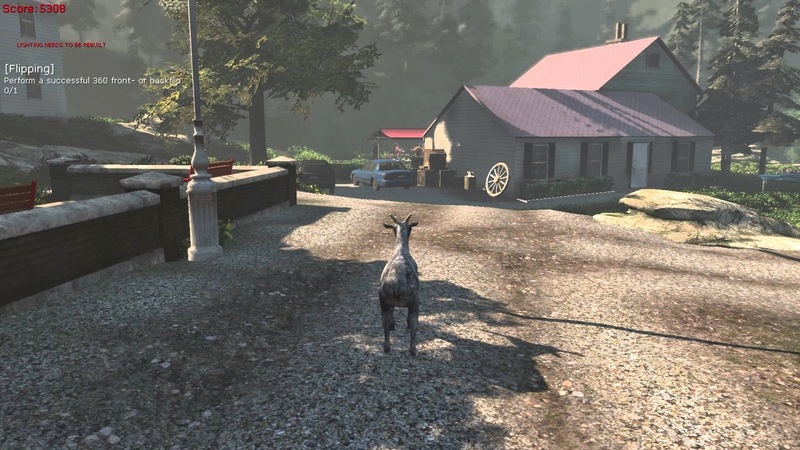 Goat Simulator looks like something that I could have fun with forever both on and off the Gamigon live! stream. It just looks like crazy fun, so let's hope that it actually get's released in the end.